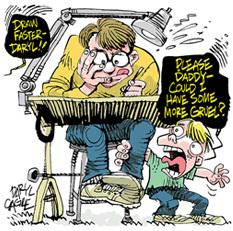 Daryl Cagle is one of the most renowned editorial cartoonist in the U.S.. His works appear in nearly 850 media. He is the founder of CagleCartoons.com a worldwide cartoonist syndicate, that distributes the works of dozens editorial cartoonists including Martin Šútovec. Daryl is also the cartoonist for msnbc.com - one of the most respected editorial sites in America. Daryl's editorial website http://cagle.msnbc.com is also very popular in schools.